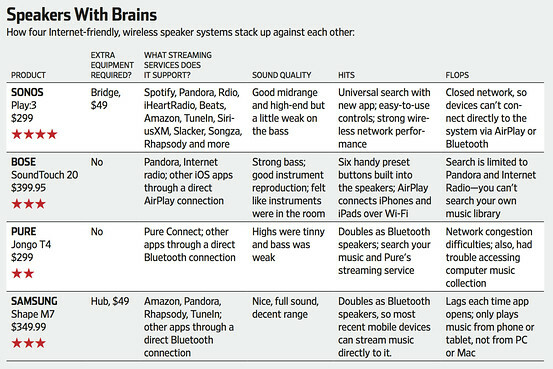 WSJ: Can Sonos Become Google for the Music You Love? Hmmm this is pretty cool – tho the speakers are pricey. This let’s you combine your music services and stream thru one speaker. WSJ: But there’s been a big change in how we’re listening to music: streaming a never-ending buffet of tunes over the Internet, instead of buying songs a la carte. Ad-supported and nominally priced “radio” services like Pandora are most popular—and even Apple’s new iTunes Radio is gaining momentum—while $10-per-month options like Spotify and Beats let you stream new releases on demand. Some even suggest songs to suit your mood. So what happens when you’ve got iTunes purchases, Pandora radio and Spotify on demand? Sonos figured it out. The clean, simplified redesign and search capability of the new Sonos app is like GoogleGOOG -1.18% for your music. The first time you install Sonos, it will scan your computer’s existing music collection and put all those songs and playlists into its database. Then it will ask you to log in to (or sign up for) streaming music services and Internet radio stations. After you’ve done that once, a search box right at the top of the new Sonos app lets you find and play songs, artists and albums across all your different sources. You can build playlists without worrying about where a song comes from—no switching apps, inputs or other kludgy controls. Just click on a song and it plays. Its midrange speaker costs $300, the same as Pure, while Samsung charges $350 and Bose $400.